Three villains. Five plotlines. One monumental success for everyone’s friendly neighborhood Spider-Man. Traditionally, the third movie in a comic book franchise tends to be a disappointment. Just take a look at X-Men: The Last Stand, Batman Forever and – arguably the worst of the bunch – 1983’s Superman III. At first glance, Spider-Man 3 seems poised to follow its third-child predecessors into the land of movies that fans pretend don’t exist. Third movies of this genre typically hit giant potholes – and plot holes – in the form of too many villains, too many convoluted plotlines, money-grubbing studio interference and the absence of whatever talented director made the first two movies successful. 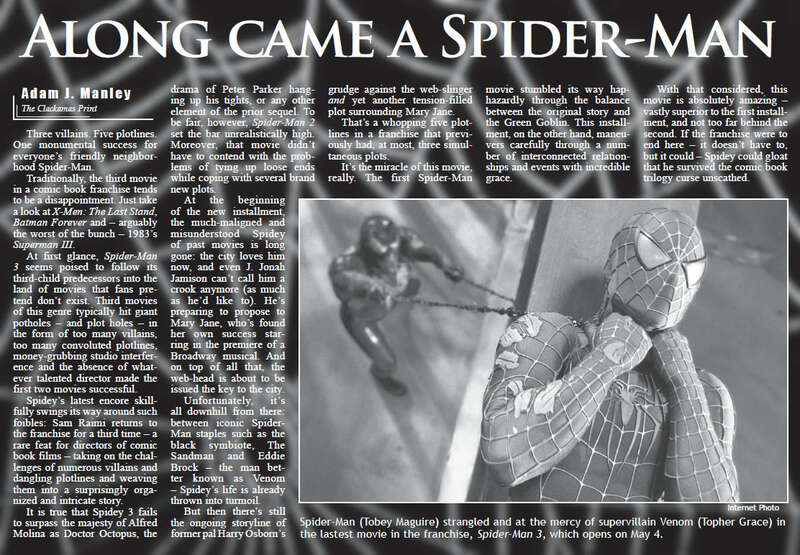 Spidey’s latest encore skillfully swings its way around such foibles: Sam Raimi returns to the franchise for a third time – a rare feat for directors of comic book films – taking on the challenges of numerous villains and dangling plotlines and weaving them into a surprisingly organized and intricate story. It is true that Spidey 3 fails to surpass the majesty of Alfred Molina as Doctor Octopus, the drama of Peter Parker hanging up his tights, or any other element of the prior sequel. To be fair, however, Spider-Man 2 set the bar unrealistically high. Moreover, that movie didn’t have to contend with the problems of tying up loose ends while coping with several brand new plots. ﻿ At the beginning of the new installment, the much-maligned and misunderstood Spidey of past movies is long gone: the city loves him now, and even J. Jonah Jamison can’t call him a crook anymore (as much as he’d like to). He’s preparing to propose to Mary Jane, who’s found her own success starring in the premiere of a Broadway musical. And on top of all that, the web-head is about to be issued the key to the city. Unfortunately, it’s all downhill from there: between iconic Spider-Man staples such as the black symbiote, The Sandman and Eddie Brock – the man better known as Venom – Spidey’s life is already thrown into turmoil. But then there’s still the ongoing storyline of former pal Harry Osborn’s grudge against the web-slinger and yet another tension-filled plot surrounding Mary Jane. That’s a whopping five plotlines in a franchise that previously had, at most, three simultaneous plots. It’s the miracle of the movie, really. The first Spider-Man movie stumbled its way haphazardly through the balance between the original story and the Green Goblin. This installment, on the other hand, maneuvers carefully through a number of interconnected relationships and events with incredible grace. With that considered, Spider-Man 3 is absolutely amazing – vastly superior to the first installment, and not too far behind the second. If the franchise were to end here – it doesn’t have to, but it could – Spidey could gloat that he survived the comic book trilogy curse. This review was originally published in The Clackamas Print. You can see the original article as it was printed below. The text above is altered; some parts of the final draft of the article were mysteriously absent when we were about to finalize the page for print. Most was fixed, but several bits toward the end were still missing in the printed version. This review as it appeared in The Clackamas Print.